This is a wonderful, fun, outdoor sale presented every year in the spring. RISD alumni sell their crafts and creations in a fun casual setting. 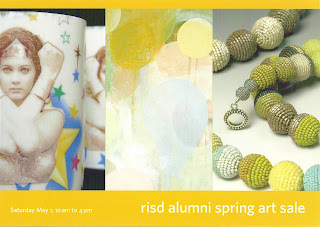 There is always food and good music, and if you want to see more great art, the RISD Museum is located adjacent to the sale. The sale takes place on historic Benefit Street, which is lined with beautiful old houses. Come for the day and shop, have lunch in one of the great restaurants around town, walk along the canals, whatever suits your fancy! It makes for a fun day trip on your own or with loved ones.